Fresh, tasty, authentic, quality Thai food is what GRAB is all about. The decor is based on creating a scene from the Bangkok markets. 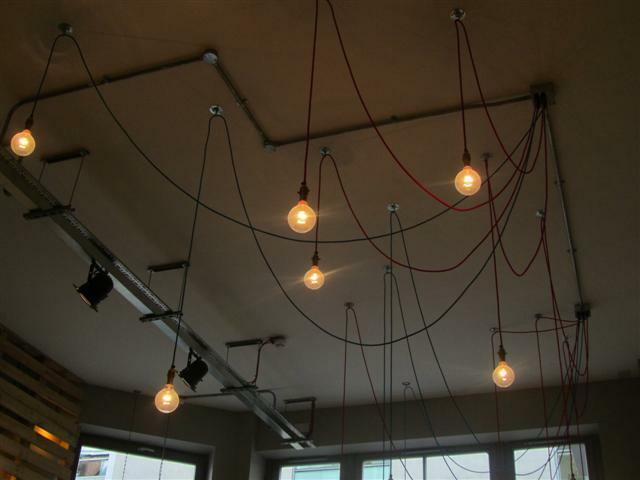 Big lightbulbs hanging from coloured wire from the ceiling and wooden tables with small plastic stools make up the casual dining area. 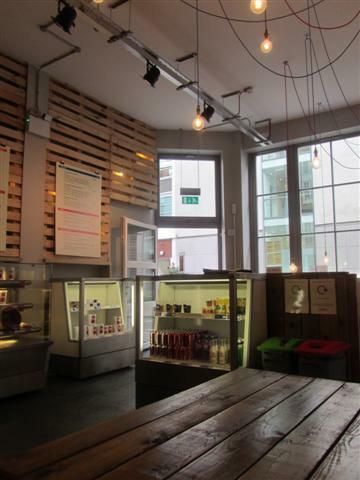 Just inside the entrance are the open fridges, with boxes of salads, iced coffees and drinks. Next to this, is the unit with the tubes of hot food, all neatly labelled. As soon as we entered GRAB, we were welcomed by the friendly staff. They asked us if we had been here before or if it was our first time. After stating that we were newcomers, the staff explained that all the hot food was ready to go, except for the curries. For the curries, we just needed to choose the type of rice (white or brown jasmine) and then bring it to the counter for it to be topped with the curry of our choice. I wasn’t sure if the curry would be too spicy but the staff were more than happy to give me a sample of it before I ordered. The green curry was slightly spicy so I went for the Pad Thai Crispy Tofu. It was great that this came in a mini size as well as regular. The mini portion was perfect and surprisingly filling. It had plenty of rice noodles, tenderstem broccoli, egg, crispy tofu, coriander, beansprouts, crushed peanuts, all topped off with a wedge of lime. Just writing about it now makes my mouth water. The Pad Thai was absolutely delicious. All the flavours were well balanced and had the right sweet and sour tastes going on. It was easy to tell that this food had no additives and no MSG in it. Instead of the Thai iced coffee and Thai milk tea, freshly squeezed carrot and apple juice was had. A very refreshing drink and there was a slight heat to it due to the addition of some fresh ginger. 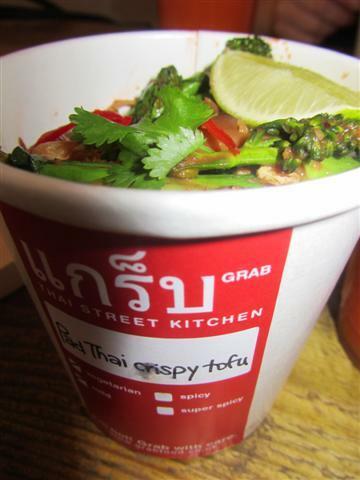 GRAB Thai Street Kitchen was extremely busy not only during the lunchtime hours but well into the afternoon. Even so, the staff were so efficient with their service that they seemed to get through the queues of customers very swiftly. The hot and cold food displays were constantly being refilled with all the freshly cooked food from the kitchen downstairs. GRAB provides a casual eating experience with diners happily munching on their pots of food standing up, when all the seats were taken. Even though I was definitely full, I was still intrigued and tempted by other items on the menu, especially the Mushroom Fresh Rolls. So, I decided to have these and the Mango and Coconut rice dessert as a takeaway order, to have at home in the evening. The Mushroom Fresh Rolls were a big portion of three rice wraps with a chilli and lime dip. The rolls were filled with Chinese mushrooms, cucumber, carrot, lettuce and rice vermicelli. The rolls were jam packed with the fillings and even without the dipping sauce, they tasted wonderful. The sweet treat had fresh slices of mango topped with sesame seeds. The coconut sticky rice was not too sweet and it had a subtle flavour. All of the food at GRAB was perfect and it’s going to be difficult to resist going to this Thai Street Kitchen on a regular basis. 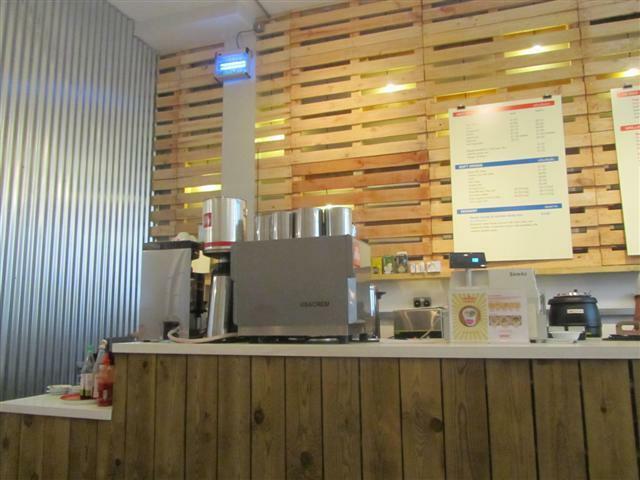 GRAB has hit the nail on the head with its great food, fantastic friendly staff, clean cafe and relaxed atmosphere. Speaking to one of the owners before I left, I was told that they had plans to expand the dining area so that it would accommodate more people. They were also going to try and have seasonal specials on the menu. It was nice to see that all the hard work and effort of the management and staff at GRAB was paying off. All the long hours and many months of planning was making this restaurant a success. GRAB definitely had their regular loyal customers and it’s easy to see why. 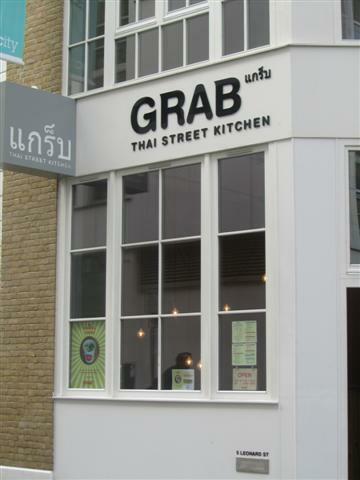 It’s great that a good honest business has got off the ground and I’m sure that GRAB Thai Kitchen will continue to thrive. Definitely loving the new dishes at GRAB. The Chicken Massaman Curry is delicious. A mild curry, jam packed with chicken, potatoes, carrots and topped with fried shallots and peanuts. Also just had to try the Moo Ping pork skewer and Chicken Satay grilled skewers. Both had tender tasty meats, cooked just right. The service and staff are still so friendly and welcoming! Look out for more noodle and rice dishes that are going to be added to the menu in the near future! 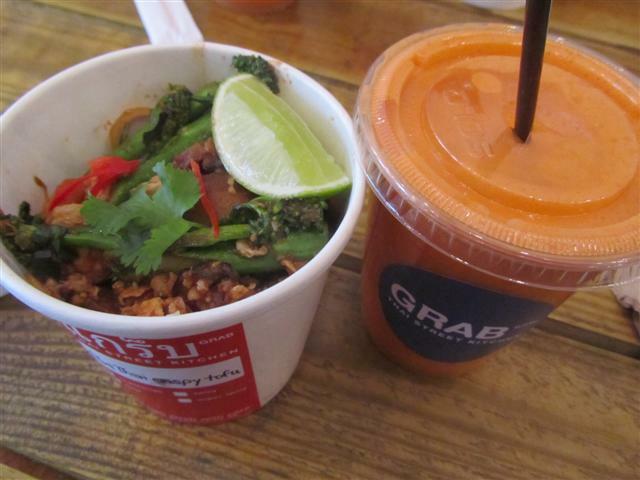 GRAB has introduced some new delicious items to their menu and also launched their new website. All in time to celebrate their first birthday! More reasons to go visit GRAB on a regular basis!